There was a tragic and unexpected death at the Town Center Valentine’s Day Masquerade. With a mystery under each feathery facade, unmasking the killer may be quite a challenge. It’s up to you to determine which party-goer is guilty, bring this crime to justice, and save the party! 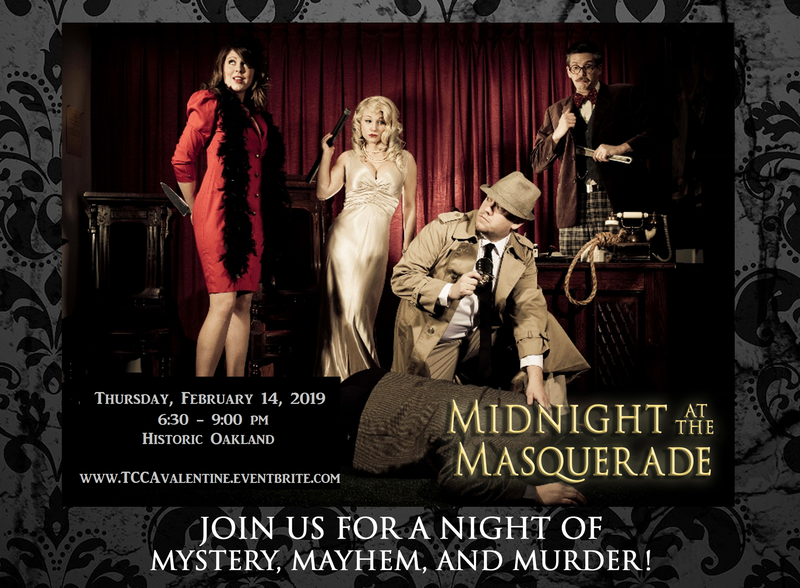 Attend the Town Center Valentine Masquerade Ball and help get this soiree back on track by trading clues with your guests, gathering information, and solving the crime before the masked menace gets away! Evening wear, ball gowns, Venetian masks, suits, and tuxes are what to wear to this high-class night of masks and murder. Get ready for a glamorous evening of mystery, intrigue, and murder. Cocktails and Hors d’oeuvres with dessert and coffee will be served. Tickets must be purchased in advance: $45 per person for those who reside on Columbia assessed property (i.e., Columbia lien payer), or $50 per person for all others. You must be 21 to attend, everyone will be carded.